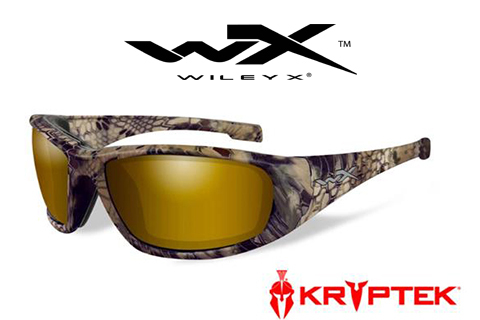 New for 2017, protective eyewear innovator Wiley X®, Inc. is introducing three popular models that combine the company’s crystal clear vision and military-grade eye protection with the unique styling and outdoor functionality of Kryptek® camouflage. Each of these new models matches a popular Wiley X frame and lens combinations with a complimentary pattern from Kryptek®, a leading American developer of battlefield-based, backcountry-ready camouflage. These new shades can give any outdoorsman a stealthy advantage in the field or on the water, yet they offer bold styling and a distinctive look you’ll be proud to wear anywhere. family, this new model features a soft, removable Facial Cavity™ Seal that blocks out wind, airborne debris and reflected light and creates a comfortable, climate-controlled environment for the eyes. This WX Boss frame is completely dressed in Kryptek® Highlander® camouflage, developed for those whose adventures take them into a wide range of elevations and mixed terrain. This pairing is not only functional; it provides a matched appearance with Wiley X’s Venice Gold Mirror lenses.Wiley X’s popular Changeable Series WX Valor is now available with a Kryptek® Typhon™ frame. This dark-as-night pattern is the perfect compliment to the WX Valor’s stealthy look and no-nonsense performance, key reasons for its popularity with military, law enforcement and tactical wearers. Model #CHVAL12 features Polarized Smoke Grey lenses that complete this stealthy look while providing clear, distraction-free vision in a wide range of environments. Like all Changeable Series models, the WX Valor allows for easy removal and insertion of accessory lenses in the field. The WX Valor also features a double-injected nose bridge and temples for a comfortable, secure fit. Those with a passion for offshore angling will love the WX Omega Model #ACOME12, featuring Wiley X’s Polarized Emerald Mirror lenses with an Active Lifestyle Series frame dressed in Kryptek® Neptune™camouflage. This cool, shadowy-blue camo embodies an aquatic predator lurking just beneath the surface, and empowers wearers with stealth and positive attitude as they stalk their favorite blue-water game. Wiley X’s combination of 8-layer polarization, amber tint and emerald mirror coating give fishermen the ability to visually pierce the surface and detect cruising gamefish, shoals of baitfish and predators hiding beneath weedlines. All adult Wiley X sunglasses meet stringent ANSI Z87.1 High Velocity and High Mass Impact Safety standards, providing OSHA-grade protection for every type of outdoor activity. Selected models (including the WX Valor) also meet the latest updated MIL-PRF-32432 (GL) Standard for ballistic eye protection. Almost all Wiley X sunglasses are also Rx-ready using the company’s exclusive DIGIFORCE™ digital Rx lens technology, for superior prescription accuracy and unparalleled visual clarity over the widest possible field of vision. 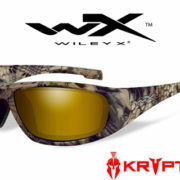 To learn more about these popular Wiley X models with new Kryptek® camouflage frames — or the company’s full line of sunglasses offering Absolute Premium Protection — visit www.wileyx.com. Or contact Wiley X at 7800 Patterson Pass Road, Livermore, CA 94550 • Telephone: (800) 776-7842.